I had to next, then put my name on studio to get the save button. Is the DCC that's included in the download package only for people who have paid for the full version? I have not installed it yet, which is probably why the built-in DCC is still working on my setup! prixat: Yes, you will need a serial number to activate it - and it will replace the free basic plugin if you install it. MS: What is the status of the DCC plugin in help>About Installed Plugins? Ya, I checked that at the time, It's listed there waiting for the serial. I hadn't checked the help about plugins because DCC is on that popup when I start studio; the one asking for serials I haven't checked the "don't show this again" on it. That was actually the first thing I thought of, that maybe my antiV didn't let it install, but it's there. Help about plugins says it failed to load. So I'll try a reinstall; again, I did a reinstall before posting about it, so I doubt it will work. I'll pause my antiV and give it another go. Have you entered your DCC serial number in DS4? Don't have one. I didn't buy DCC. Dynamic Clothing Control is not free. After the initial 30 day free trial, you have to buy and install it with separate serial number. Otherwise you just get the Dynamic Clothing Basic. It is not part of the free DS4/4.5 Pro. The point is I don't even have the basic. I have no dynamic clothing panel so I can't use dynamic clothing at all, it wont load. Dude, go to the top of the page and read down. Dude, there is nothing on this page above what I wrote saying to go to Windows>Workspace>Customize and looking in the Panes section of the Action List in the Customize window. You have said nothing about that at all. If About plugins is showing Dynamic Clothing loaded, but Dynamic Clothing is not showing under panes in Window>Workspace>customize window, then use the import in that window to impoer the default action list. ...yes I installed the dynamic clothing control even though I can't use it. It could be that unnecessary installation you did earlier that is still messing up any re-installs you're doing. Is there an uninstaller for just the DCC? 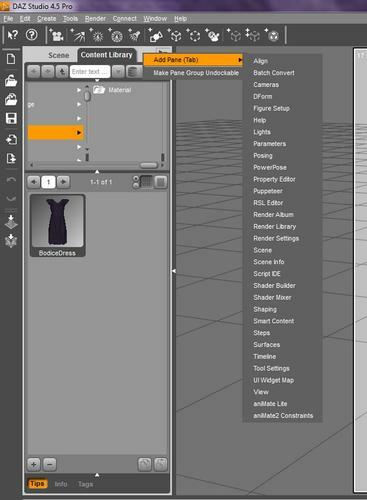 Installing the Dynamic Clothing Control disables the basic plugin by renaming the two plugin dlls by adding a .basic filetyping to them so they aren't read by DS on load. So dzautoriggerbasic.dll is renamed to dzautoriggerbasic.dll,basic and dzoptitexclothbasic.dll is renamed to dzoptitexclothbasic.dll.basic while the paid for (and serial needing) dzautoriggercontrol.dll and dzoptitexclothcontrol.dll are added to replace them. Certainly, if the full Dynamicv Clothing Control has been run in error, the proper uninstaller needs to be run to get back to the basic dynamic clothing, as the unninstaller not only removes the two DCC plugins, but also renames the two basic plugins, removinf the .basic from the end so DS sees and loads them again, and corrects the action list. So if the DCC insaller was run by mistake, the uninstaller needs to be run. If the control dlls were manually deleted and the uninstaller lost, then run the DCC installer again (just so the unijstaller is created), then run the uninstaller. Or go into the DS program folder, the plugins directory, and check that dzautoriggerbasic.dll and dzoptitexclothbasic.dll are there and don't have .basic on the end of each after the .dll. If they have the .basic, delete it so they end at the .dll. Ok how about I checked that too and it is not on the list. It wasn't when I checked the first time. I may be slow, but I have been working with studio for a while. If I could have found and added the panel by the means I already know I wouldn't have posted. I may not have used/been using studio 4 as much as studio 3, but I have been Fn with studio 4 since the first beta. And it has been nothing but a freaking headache. Have you run an uninstaller for the Dynamic Clothing Control you installed? Duh. that got it, now have the panel but why? DCC has always been part of my install and never caused this issue before? I'm still getting this problem... applying materials such as those from Super Suit shaders onto certain items still freezes DS. This has been an issue since the last version of studio. This still happens with non dynamic objects too... just regular old genesis clothing has this issue. I have the Dynamic Clothing Control, and with all DS updates up to this one I've had to reintall it. The reinstall was always necessary because the new install has always installed the Dynamic Clothing Basic, with its dzautoriggerbasic.dll and dzoptitexclothbasic.dll in the plugins folder, and even though my previously installed Dynamic Clothing Control dzautoriggercontrol.dll and dzoptitexclothcontrol.dll were still there, when both basic and control versions are present to be loaded in the plugins folder, DS loads the Basic Dynamic Clothing version, not the Control. So the installer for the Control version needed to be run again to disable the two basic plugins by adding the .basic nonsense filetype on the ends of their names again. But this time I haven't run the Dynamic Clothing Control installer, but I am getting the full control version in DS and have dzautoriggerbasic.dll,basic and dzoptitexclothbasic.dll.basic in the plugins folder, alongside the control.dlls from when I installed them lst version change. (a) DAZ have finally made the installer intelligent enough that it checks if you already have the Control version of Dynamic Clothing, if not puts in the dzautoriggerbasic.dll and dzoptitexclothbasic.dll, but if you do installs the disabled dzautoriggerbasic.dll.basic and dzoptitexclothbasic.dll.basic versions. (b) DAZ have not changed the installer but have just messed up what's in it by putting the disabled named dzautoriggerbasic.dll.basic and dzoptitexclothbasic.dll.basic in it, so everyone gets the disabled version of the Dynamic Clothing Basic installed, whether they have the Control version or not. That letter would explain ManStan's problem - didn't have the control version, and started up after the install of the new DS with disabled Dynamic Clothing Basic. 1) If you have the Dynamic Clothing Control (but without owning it and therefore having no serial), install it, ticking the option to create an uninstaller, then uninstall it with the uninstaller it created. Please see my last post above, which I wrote before seeing this of yours. I believe my suggestion (b) in that post applies - DAZ messed up and put the disabled versions of the basic Dynamic Clothing plugins in the installer (disabled simply by having the bogus filetype .basic appended to their names, as the Control version's installer does to them on installing the Control plugins) instead of the working ones. So installing then uninstalling the control un-disables them. I never assume stupidity. I always assume the possibility of forgetting or overlooking even the bleedin' obvious, simply because while I am supposedly very intelligent, i can and often do forget or overlook things that I normally know perfectly well. The number of times I've posted questions/problems over the years, then smacked my head on the wall at the answer, going 'I know that,,, I know that perfectly well. Why, at this moment, didn't I think/remember that thing I know so well' is .... considerable. Thanks again, and it looks like this version has fixed the crashing I was having using the dynamic clothes. That is why I installed the beta even though I hate beta testing any more. Edit to add: DUF I/O errored out, fail. DAE didn't save animation, separated skeleton from figure, fail. I am having trouble with key commands working in the beta. Ctrl Z is not undoing and delete is not deleting items I want to remove like it did previously. Is there a way to enable this? I know it is not my keyboard, since I can use these commands outside of daz. Try reloading your layout - I think that should reset your actions, which is where keyboard shortcuts are stored. For those using Wine with DS4.5.1.41, I have successfully loaded the 64 bit version of DS onto a test machine using Wine 1.5.18 under Fedora 17 on a test machine. I was able to load and completely render the "Ready to Render" scenes on a machine with only 2G of RAM and dual-core AMD Turion. The speed of the render was impressive. With the exception of the normal ATI lag, things seem to be "normal" under 1.5.18. I have not made my normal mods to DS4 or the CMS yet. UPDATE: Still crashing on exit. A quick question about the newest Genesis Essentials: Is there any downside to updating with a mixed 4.5.1.6 and 4.5.1.41 environment. Will 4.5.1.6 tolerate the new Genesis Essentials changes? I ask this only due to the warning in the description. I've been wanting to see what the 3Delight improvements actually perform like...reading the changelog looks pretty impressive. It seems to me, that even number Wine releases (at least the development ones) work better for me than odd numbered ones. Several of the crashes/nonstarts I had were atl100 related. I believe the potential issue is that if the older content is uninstalled and 1.9 installed in its place, without the newer version of DS, files that have been moved from Essentials to the application will be missing. As I recall you are using a centralised content repository, so in theory as long as it has the files from the new DS and Essentials 1.9 your should be OK.